In honor of the day, I thought I'd add a little something about Halloween costums. 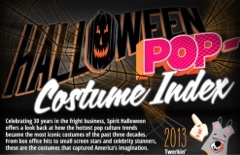 This is originally from Spirit Halloween, purveyors of all things Halloween dress-up. This is thirty years of culture, as manifest by what our children (not to mention many of us) identify with. It might be worth a discussion in the teachers' lounge (Ya'll still do have teachers' lounges?) about what you dressed up as, way back when. Anyone ever dress up as a hobo? Does anyone in your lounge know what a hobo is?